The DIA Urban Arts Project Program was developed jointly by Art in Public Places Committee and the Downtown Investment Authority (DIA). Both entities were formulated under and acting on behalf of the City of Jacksonville. The Art in Public Places Program of The Cultural Council of Greater Jacksonville recently completed the first phase of the three-phase civic engagement initiative to promote community development through use of public art installations which enhance the urban environment and provide attractive streetscapes. 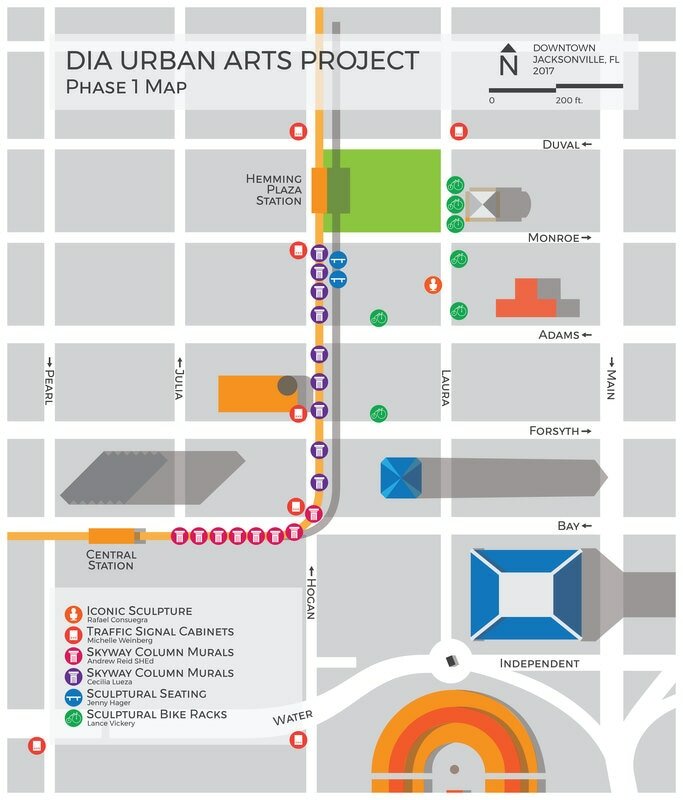 Phase I of the DIA Urban Arts Project resulted in six separate categories by six artists consisting of 38 public artworks in downtown Jacksonville. The Cultural Council of Greater Jacksonville, Art in Public Places and the Downtown Investment Authority on behalf of the City of Jacksonville, Florida announce a Call to Artists for a Request for Qualifications for Phase II of the DIA Urban Arts Project. The call solicits artists who can address streetscape aesthetics with functional and interactive public art that serves to draw attention to an outdoor urban area utilized during both daytime and nighttime. Artists are encouraged to explore ways to integrate public art with technology and renewable sources of energy. This urban arts project is located near the St Johns River in an area that received significant environmental impact from Hurricane Irma in 2017. The four categories of public art include vinyl wrapped traffic signal cabinets, sculptural bicycle racks, 2-D art and outdoor sculpture. Individual artists or artist teams may apply to address the sites by combining multiple categories and media to achieve the greatest comprehensive aesthetic and interactive impact. For the categories of environmental sculpture and 2-D art, preference will be given to artwork that incorporates lighting or luminescent elements and/or projection or other electronic art for creative place making and wayfinding. Sculpture and 2-D projects could be creatively combined to make 2-D light patterns on the ground throughout the site. Jacksonville is interested in showcasing eco-friendly, forward thinking aesthetic designs that find solutions to environmental concerns, such as incorporating solar-powered lighting or light producing and/or heat reducing surface coatings. The budget for all categories combined is currently $104,718. A single artist or artist team who addresses the entire site with a comprehensive environmental impact scheme would receive $104,718 for design, fabrication and installation. The local electrical authority is partnering with the project to provide some financial assistance and technical expertise with lighting. Q. How do I submit my proposal drawings for DIA Urban Arts Project Phase II RFQ? A. This call to artists is an RFQ, Request for Qualifications. No proposals or drawings are requested or desired. Any designs would not be required until a artist is commissioned and has attended public meetings and information gathering. Q. What needs to be written in the application? Q. What about the images required? A.Care should be taken to provide good, representative images. The Art Selection Panel will do the first review based solely on the 4-8 images submitted (plus 1-2 videos if necessary)/ They will not have access to any other qualifications of the applicant--no name, years of experience, cost of artwork, etc. They will select based on the response to the visual image and whether they think such work would be appropriate for the sites or if the artist could do work for the sites. Phase I commenced in January, 2016 with a Call to Artists requesting that individual artists or artist teams submit images and qualifications to create a total of 34 projects to engage audiences of all ages at the street level. The goal was to further enhance and shape the city’s overall design, functionality, and visual aesthetic. A nine-member Arts Selection Panel, as stipulated by the APP Ordinance, selected six artists from a pool of applicants. All artists participated in public meetings and researched the area prior to submitting their final designs. The six public artists fabricated and installed the streetscape works during the spring of 2017. Cecilia Lueza is an Argentine-born, American-based, 2-D and 3-D artist. Lueza studied visual arts at the University of La Plata in Buenos Aires, Argentina. She is well known for creating vibrant public art pieces in a range of mixed media. Lueza has completed public art projects in Washington DC, Virginia, Arizona, Florida, New Mexico, Maryland, Tennessee, Missouri, and Argentina. Lueza covered nine of the JTA Skyway columns along Hogan Street from Hemming Park Station to Bay Street. Andrew Reid received recognition for his work as a graphic artist in his native New Zealand before moving to the United States. Originally relocating to New York, Reid has lived in Miami since 1991. Reid's work explores a variety of medias and his clients include state, local art entities, not-for-profit corporations, interior designers, and architects. Reid covered eight of the JTA Skyway columns, running from Bay Street to Central Station. Michelle Weinberg is a visual artist whose work includes paintings and collages, designed rugs, and mosaic and painted murals. Her imagery inhabits a "Pretend Dimension," in which elastic perspectives, personalized geometries, and fictitious architectures elaborate stage-set like narratives. Her works in all media are conceived as vivid backdrops for human activity. Weinberg designed images for vinyl wraps that were placed on seven traffic signal cabinets. ​To make bicycle parking more readily available along shared streets and at destinations, Phase I is adding parking for fifty bikes with sculptural bike racks that balance form with function and complies with national bicycle parking standards. Lance Vickery is a sculptor and an Adjunct Professor of Art and Design at University of North Florida's College of Arts and Sciences. ​Vickery designed and fabricate several sets of sculptural bike racks that depict earth, wind, fire, and water. Street furnishings take the form of benches, chairs, trash receptacles, planters, etc. They are designed with function and are provided where social activity exists in public spaces. Sculptural seating will allow for socializing and gathering along a main pedestrian connector. Secondary seating, such as planter and other raised surfaces, may be encouraged in future developments. ​Jenny Hager is a sculptor and an Associate Professor of Sculpture at University of North Florida's College of Arts and Sciences, where she has taught for nearly a decade. Hager's work utilizes a variety of processes and materials, including: steel, cast iron, post-it notes, video, wood, digital photography, and found objects. As an artist, Hager finds inspiration in dreams, objects from her childhood, gadgets, sea life, and other curiosities. ​Hager designed and fabricate sculptural seating along Hogan Street. In Phase I of the DIA Urban Arts Project One iconic outdoor sculpture is being displayed for permanent exhibition in the public realm. This project is designed to shape the city and aesthetic legacy, promote public interest in outdoor public art, develop community pride, and draw visitors to the retail or civic areas where displayed. Rafael Consuegra is a sculptor and ceramist with over 50 years of experience. Born in Cuba, Consuegra, seeking exile, left Cuba in 1960 and relocated to Miami, Florida. He relies on his unique vision, insight, and ability to breathe life into clay and metal. Consuegra finds inspiration in the mundane, the extraordinary, and the spiritual and his sculptures range in size from small-scale work to monumental art commissions. Consuegra designed and fabricated a large iconic outdoor sculpture that was placed near the corner of Monroe Street and Laura Street.